Second Acts are Everywhere in America – Hello, Tigers! New Orleans I’m not a fan of golf. Very little about the game has every appealed to me, partially for class reasons. As a kid, every blue moon we would make a couple of bucks retrieving balls in the watery ponds at the City Park course for a quarter a ball. I once caddied for my uncle in Duncan, Oklahoma, on the hot, barren course there when I worked one summer in Velma as a roustabout after graduating from high school. It was sport without any appeal and a lot of problems in my mind, not the least of which was that watching it was boring. 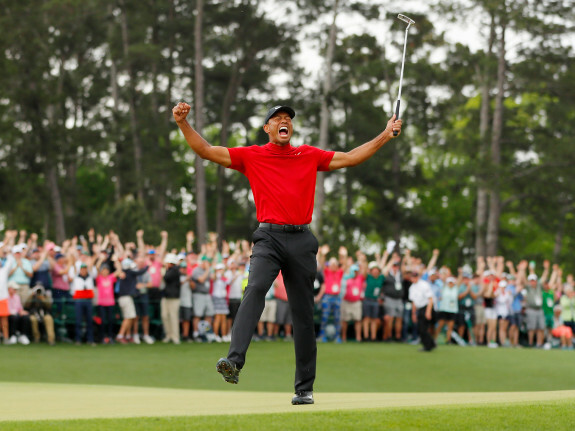 But, I’ll admit to rooting for Tiger Woods and his comeback for all of the same reasons, and was incredulous when I first saw the headline scroll across my phone that he had won the Masters, the biggest, whitest, richest professional tournament in the world. It was too early in the day. This was probably fake news, clickbait. The tournament couldn’t be over. I had forgotten reading that there was an early start because of potential weather problems in Georgia. I’ve now read every article about his victory in three or four papers this morning. I couldn’t care less what it means for the game of golf or the oft repeated headline that this was a “victory for the ages.” I like it because it puts another exclamation point on the fact that second acts are everywhere in America. The author F. Scott Fitzgerald is famously quoted as saying “there are no second acts in America.” Fitzgerald scholars’ wince that this line is a misreading of Fitzgerald and a flagrant misquote arguing that the phrase is out of context because the rest of his line went on to establish that in fact there were second acts. Second, third, serial acts are hallmarks of American life with boundless examples in almost every field of endeavor including business, politics, show business, and on and on. Think about serial bankruptcies and failed startups that still became successes. Think about inventors who failed repeatedly. Think about politicians who lost races but kept coming back to the voters until they won. Think about actors, singers, and artists, who bombed terribly, and kept coming back. The real story is not that there are no second acts. There are millions. The real story of America is never quitting, being willing to fail, dusting yourself off and getting back upon the horse, never say die, there’s always a next time. That’s America, and for a change Tiger Woods displayed that the best of America is not natural talent or amazing gifts, but true grit. Something we can all display every day. This entry was posted in Ideas and Issues and tagged Masters, second acts, tiger woods by Wade. Bookmark the permalink.